Trifle is a classic Christmas dessert. In Australia, a festive trifle would always be served for Christmas dessert, along with Christmas pudding. 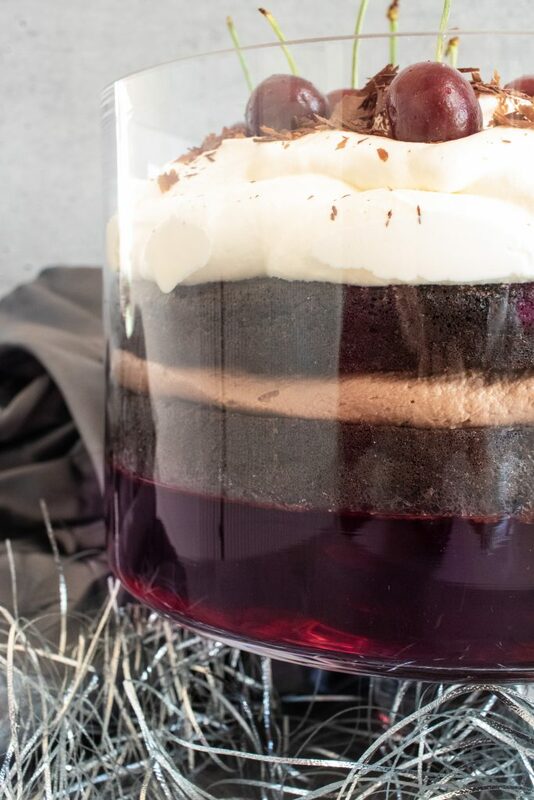 This black forest trifle will become your new favourite Christmas dessert. The best thing about it is that it is keto friendly, so we can all enjoy it this Christmas. 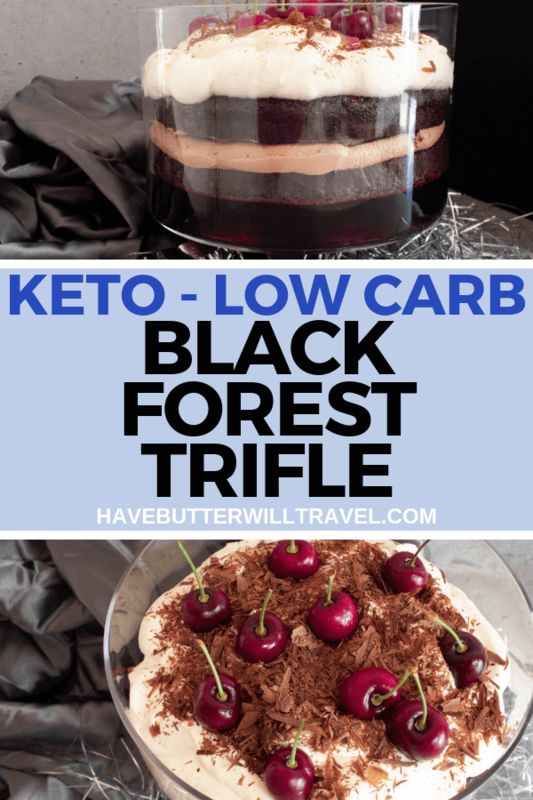 We absolutely love trifle here at Have Butter will Travel and this black forest trifle is our third trifle recipe. Trifle is the classic Christmas dessert. Traditionally, trifle is a layered dessert usually consisting of jelly, cake, custard, fruit and cream. If you are a big fan of trifles, like we are, make sure you check out our raspberry trifle and tropical trifle. Christmas is a time spent hanging out with family and friends. It is also a time where we are faced with desserts and treats that we might not face on a day to day basis. 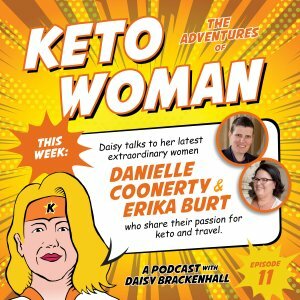 Our favourite strategy for dealing with this, is to make our favourite keto desserts to take to Christmas get togethers. Check out some of our favourite keto Christmas desserts. 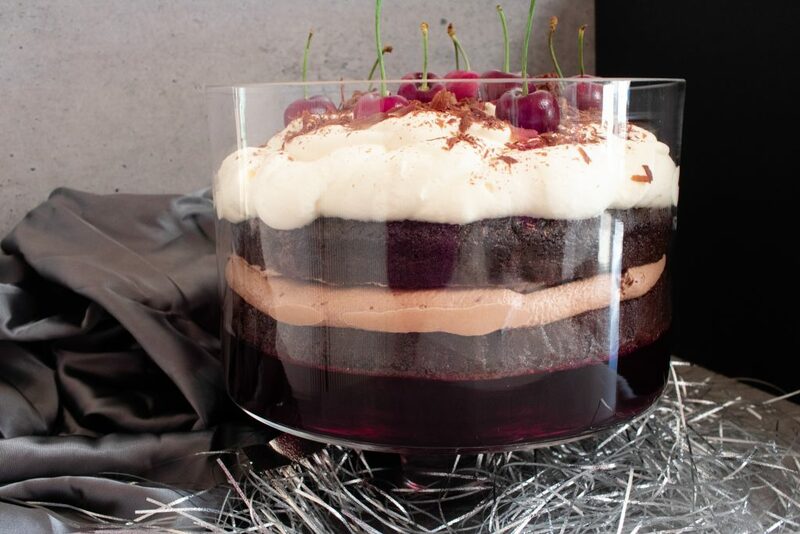 Traditionally, black forest cake would be a chocolate cake with cherries and whipped cream sandwiched between the cake layers. So we took that inspiration used these flavours for this black forest trifle. 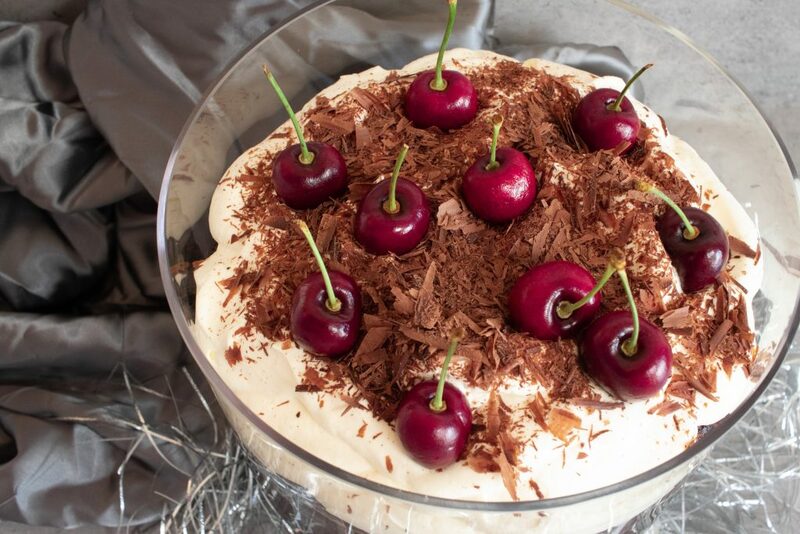 This trifle includes cherry jelly/jell-o, chocolate cake, cherry jam/jelly, chocolate filling, cream and cherries. 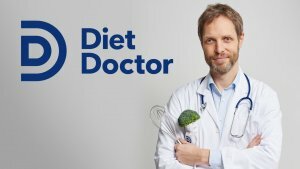 If you live in North America you won’t be able to access all the awesome ingredients from Low Carb Emporium. 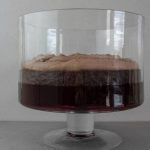 Here are some alternative ingredients, so you will also be able to make this delicious black forest trifle. Good Dee’s Chocolate Cake Mix Make the cake as per directions. Chocolate filling We would recommend making this chocolate filling from Low Carb Yum and just leave out the cherry extract. If you make this chocolate filling, you can skip the filling step in the instructions, as this will replace it. Cherry Jelly. We have had difficulty finding good quality sugar free cherry jelly. 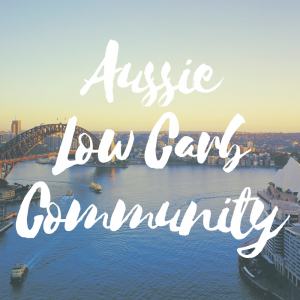 We have found a few different options and we will let you decide the best option for you. 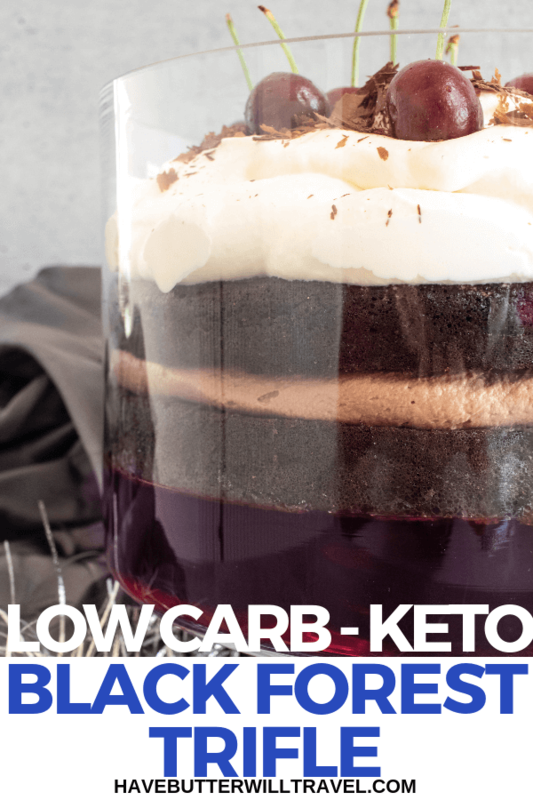 Are you looking for that perfect keto dessert for a celebration? This black forest trifle is perfect for Christmas lunch or any celebration. 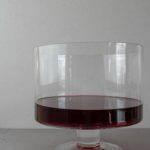 Make the jelly/jello as per packet instructions and allow to set overnight in the bottom of your trifle dish. Make the cake as per instructions and set aside the frosting mix for the filling instructions. Allow cake to cool completely and then wrap it cling wrap and place in fridge to become cold before cutting. 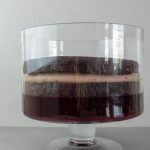 Cut the cake in half to create 2 even circular layers. Set aside for assembly. In a medium sized bowl, place the cream cheese. Using a hand mixer, beat the cream cheese for 1-2 mins. Add the frosting mix and pure cream to the cream cheese mixture and continue to mix with hand mixer, starting on low and increase to high for 2-3 minutes until the mixture is fully combined and fluffy. Set aside for assembly. Place the cream in a bowl, using a hand mixer beat cream on high until soft peaks form. Set aside for assembly. Spread the jam onto the cut side of both of the chocolate cake discs. 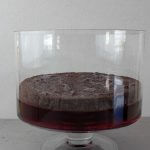 Place one of the chocolate cake discs, jam side facing up, on top of the jelly layer that has been set in the trifle bowl. Place all the filling on top of the cake, spreading evenly. Place the second cake disc, jam side down, on top of the frosting layer. Pile the cream topping decoratively on top of the cake and top with cherries for garnish. Nutritional panel does not include the garnish of cherries. Total time does not include setting and cooling times.